Katra, April 05: Shri Mata Vaishno Devi Shrine Board has made elaborate arrangements for the larger number of pilgrims who are likely to visit the Holy Cave Shrine of Shri Mata Vaishno Devi Ji during Navratras, which are commencing from tomorrow. These arrangements include ensuring proper water and power supply along the Track leading to the Shrine, sanitation and availability of special fast related food at the Bhojanalayas of the Shrine Board. 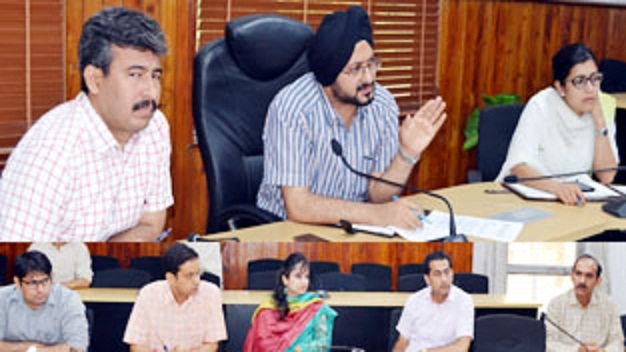 In this context, Mr. Simrandeep Singh, Chief Executive Officer, Shri Mata Vaishno Devi Shrine Board, reviewed these arrangements with Mr. Vivek Verma, Additional Chief Executive Officer; Deputy Chief Executive Officers, concerned engineers and unit heads of the Shrine Board, keeping in view the large flow of pilgrims expected during the Navratras. He took stock of the arrangements put in place for the pilgrim’s enroute and in the Bhawan area. The Bhawan of Shri Mata Vaishno Devi Ji, Atka and the area surrounding it have been tastefully decorated with flowers brought from various parts of the country and abroad. All the routes leading to the Holy Cave Shrine have been fully maintained for smooth movement of pilgrims, besides ensuring sufficient supplies of provisions, food, water etc. along the Track. The Shrine Board has also launched a special sanitation drive on the track and in the Bhawan area for ensuring utmost sanitation and cleanliness. This cleanliness drive is in addition to the normal sanitation activities of the Shrine Board which include maintaining sanitation along the entire track and various establishments of the Shrine Board.